The costs of transportation are increasing. Gas prices are on the rise, with crude oil prices at $67 per barrel (more than double the low of $30 in early 2016), and the threat of additional tariffs increasing the price of cars and car parts. So how can we quantify transportation costs for a specific location to build a comprehensive housing budget? Financial planners have geographically based transportation cost estimators, but an easy way to estimate these costs is by downloading a location specific “Fact Sheet” from the Center for Neighborhood Technology (https://htaindex.cnt.org/). For example, CNT’s 2017 Fact Sheet for Riverside-San Bernardino-Ontario, CA shows that average annual transportation costs are $14,262 (=26% average income), and that housing costs are 33% of average income. 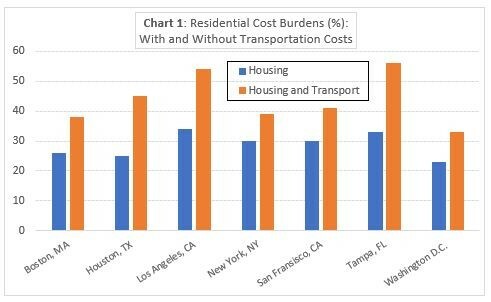 The chart below, using CNT estimates, illustrates how the inclusion of transportation costs can change the calculus of affordability—especially in large metro areas with less efficient transit systems. When discussing financial needs with potential reverse mortgage borrowers, it is helpful to have a sense of their real regular expenses. Looking at housing alone, without transportation, under-estimates real expenses. The CNT fact sheet can help you share a more accurate assessment of needs.